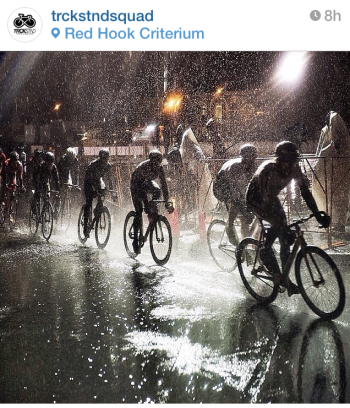 The Red Hook Crit. This was the craziest sporting event I've ever been to and probably the craziest I've ever participated in. The main event, the bike race, consisted of 22 lap criterium on a technical course around the docks in Red Hook, Brooklyn. It was pouring rain. It was dark. People were racing fixed gear bikes, with NO BRAKES. It was actually scary to watch and unfathomable to understand how the riders stayed upright on their bikes (well, some of them didn't). The display of fearlessness was like nothing I'd ever seen. But I wasn't there to participate in the bike race. The second event of the night was a 5k run race on the bike crit course. The race had a good prize purse, $1000 for the winner and money down to 10th, so it drew a lot of talent. It was funny looking around the inside of the Brooklyn cruise terminal building where we were waiting for the race to start (and staying dry). 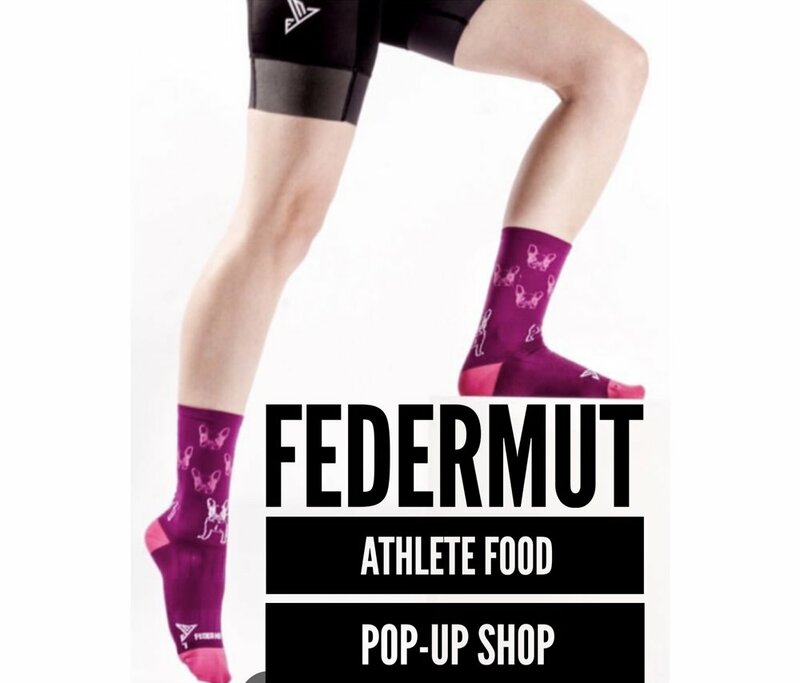 There were tough, hipster bike racers warming up on rollers (no handed) while the skinny runners were waiting with their feet up for their races to start. I'd highly recommend racing in or watching this event...even in the pouring rain! My plan for this race was to just go out and put in a good, solid effort. The hope was that his effort would put me in the top 10 and I'd go home with some cash money. 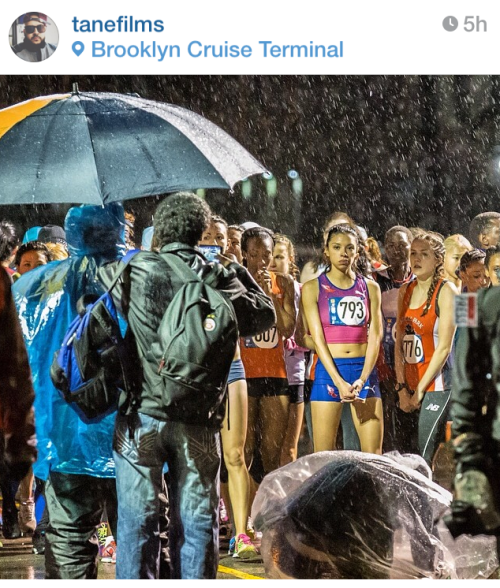 On a night when there were plenty of distractions - a 75 minute start delay, a 46 degree drenching rain, a swarm of speedy runners on the start list, and a gut-busting bike workout I did the day before - I focused on the opportunity to get out there and run fast. Photographer @TaneFilms captured the women's starting line. Click on the pic above to his other awesome photos. After sitting in the terminal building for over an hour, watching the bike racers leave fully warm up and return freezing cold, cramped and, in some cases, road rashed, I took to the streets of Red Hook for a warm up. Two blocks into my solo pre-race run, I got spooked by a stray cat and the dark, empty streets and ended up just running back and forth on one block for 15 minutes. I could just hear people saying, "she went out for a warm up and never came back…" It was just that kind of night. The race itself was way less spooky. It was actually really fun! There were lots of big puddles, slippery man hole covers, 180 degree turns, and a ton of fans lining the course. My legs felt cold for the first few minutes of the race, but quickly warmed up. Per my coach Tim's instructions, I went out in what felt like a conservative pace and tried to run even splits. I thought maybe I'd be able to see what the splits were, but it was way too dark to see my watch. 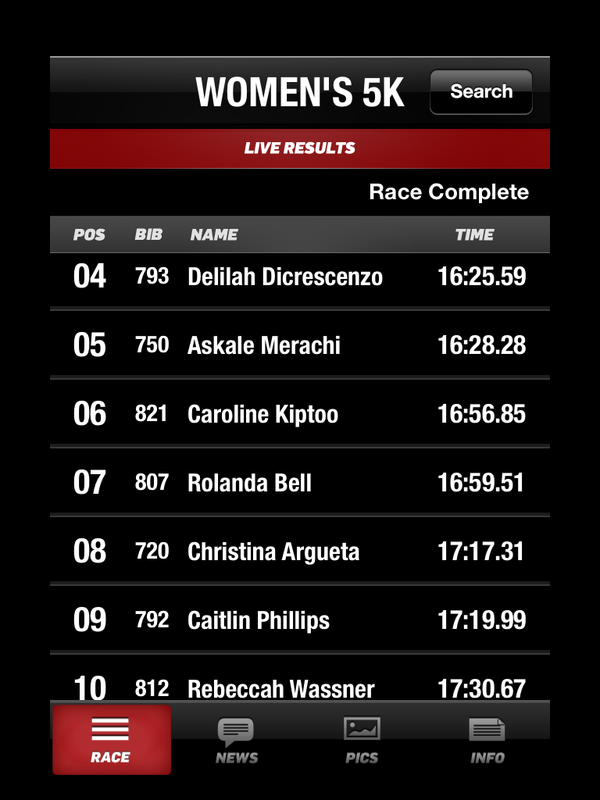 The top 6 or so women took off and must have run close to 5 minutes for the first mile. I hung with two other girls, one from NYAC and one from Central Park Track Club. They pulled away from me about 3/4 of the way through and I fought to keep their strong pace. I had no idea what time I was running and was shocked to see 17:20's when I approached the finishline. At that point, I didn't even care what place I was in because I'd run a post-baby PR and way faster than any expectations. Getting 10th was just a bonus. 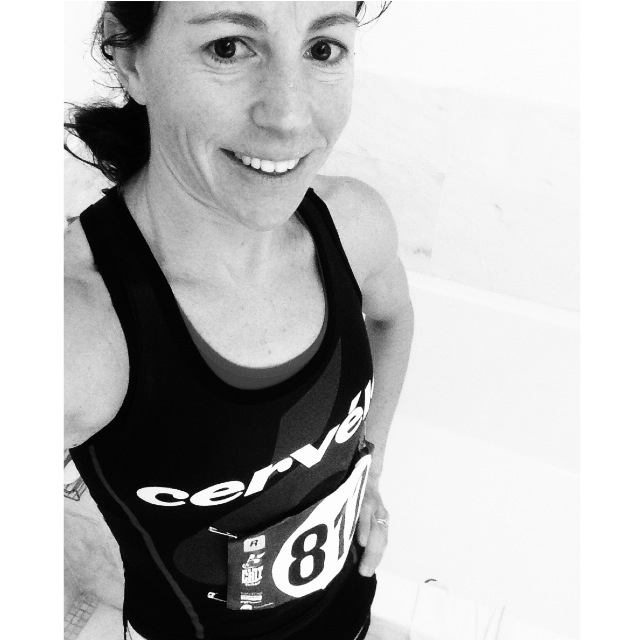 When I got home, I checked my splits and they were, by mile, 5:16, 5:31, 5:36 and my gps measured the course to be 3.21. That first mile seems off to me because it didn't feel like I was running that fast. Although, I'm not sure I know what fast feels like since I haven't done any run workouts this year, other than the two sprint triathlons a few weeks ago. The key has been that I've been able to put in consistent running (about 30-35 miles a week) for about 2 months now. Getting back my running form has been a gradual process, with lots of stops and starts. But with this race, I'm more confident that it'll return. A HUGE thank you to two friends who played a big part in making this race happen. Annick stayed outside in the cold and watched Maya the entire night. Anne sat with me inside during the delay and watched and carried my stuff. Both greeted me with smiling faces at the finishline - Anne handed me dry clothes, Annick handed me Maya, and I took her for a victory lap.